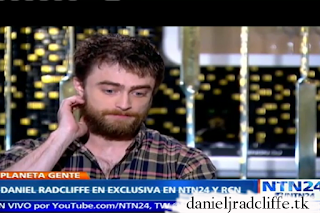 Daniel talked exclusively with Latin America's NTN24's Planeta Gente while he was filming Jungle in Bogota, Colombia earlier this year. Ofcourse about Jungle but also about Swiss Army Man. The interview is dubbed in Spanish. "Fantasy gives you the opportunity to explore something very human in a very strange way. Being in a fantasy film is like the magic realism of literature"